Good morning! 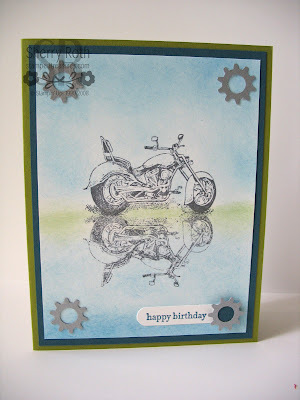 I thought I would share a card with you that we did at our June stamp clubs. The reflection technique is one that I have never done before. I love how simple it is and will definitely be doing it again! The image is the Motorcycle (117657) from the a la carte page of the Summer Mini (page 31). I love these individual stamps. The shapes in the corners were cut from Brushed Silver cardstock using the Cogs Double punch (118873). The background was done using sponges. We are coming to the end of June and the end of the current Idea Book & Catalogue, be sure to check out the retired lists to make sure you've picked up everything on your wish list before it's gone for good.